They are creepy to me. The way they look, feel, fly, smush, etc. but moths creep me out and scare me a little. And I like butterflys which I know doesn't make much sense but whatever I don't like moths. I figure the best way to get past this moth loathing is to find out more about them, see if there is any good and beauty in them, and maybe just maybe I will not think they are so bad (shiver). So I found a photo of this red moth that is really quite pretty and not as skeevy as most. The male red moth dines on the fluid from the dog fennel plant and stores some of it in pouches under his abdomen. When the little guy goes a-courtin he discharges the fluid all over the female. The fluid contains a variety of alkaloids from the plant that repels predators. (such as spiders) Indeed, virgin moths coated with the stuff and then placed into spider webs are quickly cut free by the spider! This insures that no one will eat the female moth and Mr. Moth can copulate with her for NINE hours. (it can take that long to impregnate the female) Whew. Well that was pretty interesting, now back to my studies. betcha that stinky red moth would fly right for your face just like any other stinky moth. betcha that moth has gross death powder on its wings like regular moths. betcha red moths sit by the lamp on the porch just waiting for you to open the screen door so they can fly at your face and get their yucky death powder on your cheeks. ew. moths are gross. moths are the spawn of the devil. I'm just glad I'm not a female moth. ok what meow said just cracks me up! lol. i do not like moths either. and yes they are so messy when smushed. but wow, the male moth sounds a little protective (or possessive!). Does the nine hours include foreplay and cuddling after? Do you have the same aversion to moth orchids? 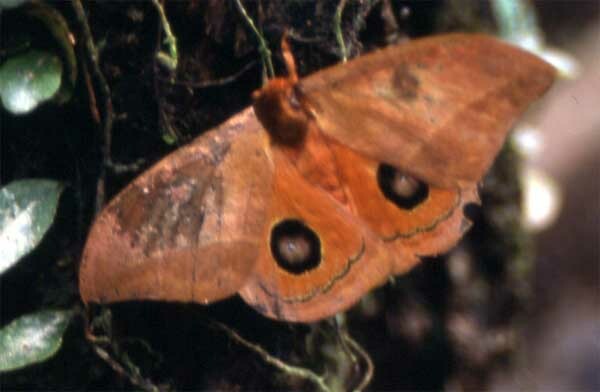 Do those two eye-like shapes not creep you out on the pictured moth? Some moths are as beautiful if not more beautiful than butterflies. Meow - that's my girl! lol, God, I hope so. No, now those are beautiful! nope, and I like that they can scare predators away. I am learning that. Just not the ones I usually see!